Bay laurel (Laurus nobilis, Lauraceae). Fresh or dried bay leaves are used in cooking for their distinctive flavour and fragrance. The leaves should be removed from the cooked food before eating (see Safety section below). The leaves are often used to flavour soups, stews, braises and pâtés in Mediterranean and Latin American cuisine. The fresh leaves are very mild and do not develop their full flavour until several weeks after picking and drying. California bay leaf – the leaf of the California bay tree (Umbellularia californica, Lauraceae), also known as California laurel, Oregon myrtle, and pepperwood, is similar to the Mediterranean bay laurel, but has a stronger flavour. Indian bay leaf or malabathrum (Cinnamomum tamala, Lauraceae) differs in that bay laurel leaves are shorter and light to medium green in colour, with one large vein down the length of the leaf, while tejpat (Cinnamonum tamala) leaves are about twice as long and wider, usually olive green in colour, and with three veins down the length of the leaf and is culinarily quite different, having a fragrance and taste similar to cinnamon (cassia) bark, but milder. Indonesian bay leaf or Indonesian laurel (salam leaf, Syzygium polyanthum, Myrtaceae) is not commonly found outside Indonesia; this herb is applied to meat and, less often, to vegetables. 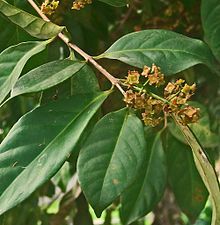 West Indian bay leaf, the leaf of the West Indian bay tree (Pimenta racemosa, Myrtaceae), used culinarily and to produce the cologne called bay rum. Mexican bay leaf (Litsea glaucescens, Lauraceae). The leaves contain about 1.3% essential oils (ol. lauri folii), consisting of 45% eucalyptol, 12% other terpenes, 8-12% terpinyl acetate, 3–4% sesquiterpenes, 3% methyleugenol, and other α- and β-pinenes, phellandrene, linalool, geraniol, terpineol, and contain lauric acid also. Bay leaves can also be used scattered in a pantry to repel meal moths, flies, cockroaches, mice, and silverfish. Bay leaves have been used in entomology as the active ingredient in killing jars. The crushed, fresh, young leaves are put into the jar under a layer of paper. The vapors they release kill insects slowly but effectively, and keep the specimens relaxed and easy to mount. The leaves discourage the growth of molds. They are not effective for killing large beetles and similar specimens, but insects that have been killed in a cyanide killing jar can be transferred to a laurel jar to await mounting. There is confusion in the literature about whether Laurus nobilis is a source of cyanide to any practical extent, but there is no evidence that cyanide is relevant to its value in killing jars. It certainly is rich in various essential oil components that could incapacitate insects in high concentrations; such compounds include 1,8-cineole, alpha-terpinyl acetate, and methyl eugenol. It also is unclear to what extent the alleged effect of cyanide released by the crushed leaves has been mis-attributed to Laurus nobilis in confusion with the unrelated Prunus laurocerasus, the so-called cherry laurel, which certainly does contain dangerous concentrations of cyanogenic glycocides together with the enzymes to generate the hydrogen cyanide from the glycocides if the leaf is physically damaged. Some members of the laurel family, as well as the unrelated but visually similar mountain laurel and cherry laurel, have leaves that are poisonous to humans and livestock. While these plants are not sold anywhere for culinary use, their visual similarity to bay leaves has led to the oft-repeated belief that bay leaves should be removed from food after cooking because they are poisonous. This is not true; bay leaves may be eaten without toxic effect. However, they remain unpleasantly stiff even after thorough cooking, and if swallowed whole or in large pieces, they may pose a risk of harming the digestive tract or causing choking. Thus, most recipes that use bay leaves will recommend their removal after the cooking process has finished. ^ “Spice Trade: Bay Leaf”. Archived from the original on 12 April 2009. Retrieved 2009-04-11. ^ “Spice Pages: Indonesian Bay-Leaf”. Retrieved 2012-12-01. ^ “Encyclopedia of Spices: Bay Leaf”. Retrieved 11 April 2009. ^ “How to Repel Grain Moths with Bay Leaves”. Retrieved 2009-04-11. ^ Palacios, S; Bertoni, A; Rossi, Y; Santander, R; Urzua, A (2009). “Efficacy of Essential Oils from Edible Plants as Insecticides Against the House Fly, Musca domestica L.” Molecules. 14 (5): 1938–1947. doi:10.3390/molecules14051938. PMID 19471213. ^ Hedin, Paul Arthur; Hedin, Paul A. (1991). Naturally Occurring Pest Bioregulators – ACS Symposium Series (ACS Publications). ACS Symposium Series. 449. doi:10.1021/bk-1991-0449. ISBN 978-0-8412-1897-0. ^ Marzouki, H; Piras, A; Salah, KB; Medini, H; Pivetta, T; Bouzid, S; Marongiu, B; Falconieri, D (2009). “Essential oil composition and variability of Laurus nobilis L. growing in Tunisia, comparison and chemometric investigation of different plant organs”. Nat Prod Res. 23 (4): 343–54. doi:10.1080/14786410802076200. PMID 19296375. ^ Benwick, Bonnie S. (30 September 2014). “Bay leaf: Should it stay or should it go?”. Washington Post. Retrieved 5 January 2018. ^ “Straight Dope: Are Bay Leaves Poisonous?”. Retrieved 2009-04-11.